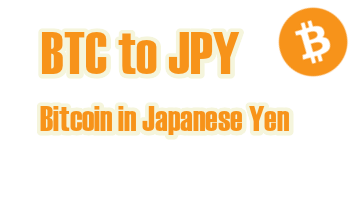 Convert Bitcoin (BTC) to Japanese Yen (JPY): 423,169.52 JPY | Live Bitcoin Price in Japanese Yens. Bitcoin in Japanese Yens (BTC to JPY) live exchange rate at liveBTCprice.com. Bitcoin price calculated in Japan money yens, BTC to JPY charts, live updates, latest news.